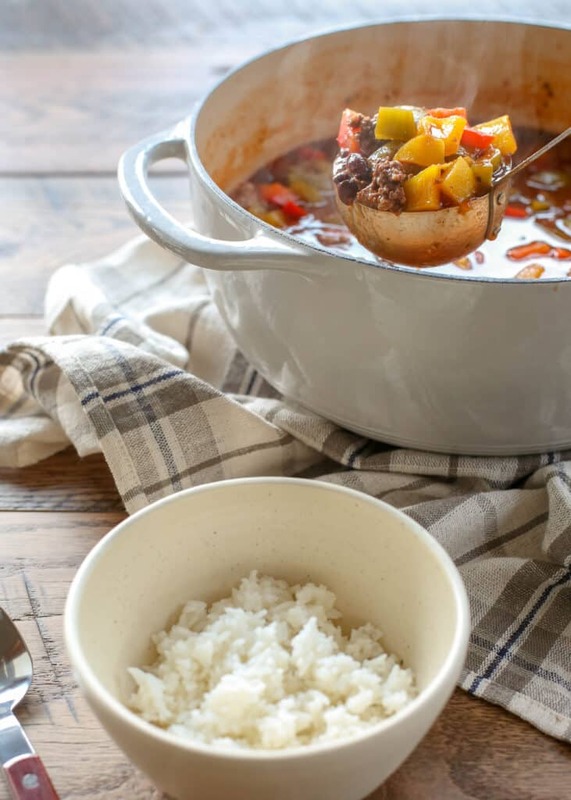 Slow-Cooker Stuffed Pepper Soup is full of seasoned beef, rice, bell peppers and plenty of rich flavors. This first time I made this soup, I suspected it was going to be a hit with my family and I was right. I created this soup on a cold winter night when I was craving a hearty and warming soup and Sean was craving stuffed peppers. Spicy Italian Stuffed Bell Peppers are one of Sean’s favorite meals and for a good reason. The combination of textures and flavors in a stuffed pepper is hard to beat! I had a hunch that those same ingredients could come together to make a tasty soup and I was right. What I didn’t expect is just how much Sean and my boys loved it. My oldest son commented that it reminded him of the stuffed peppers and the other two kids ate every bite as well. Stuffed Pepper Soup was an immediate favorite from the first bite and we’ve made this soup countless times over the past few years. The soup freezes beautifully and I keep individual size containers in the freezer for easy lunches. If you make a lot of soup you might have noticed that it often tastes even better the next day once the flavors have had a chance to deepen and meld. Cooking this soup in the slow cooker means you get that delicious “second day” flavor right from the first taste. Another reason I love slow cooker stuffed pepper soup is that you can prepare it early in the day, throw everything in the crock pot then forget about it until dinner time. 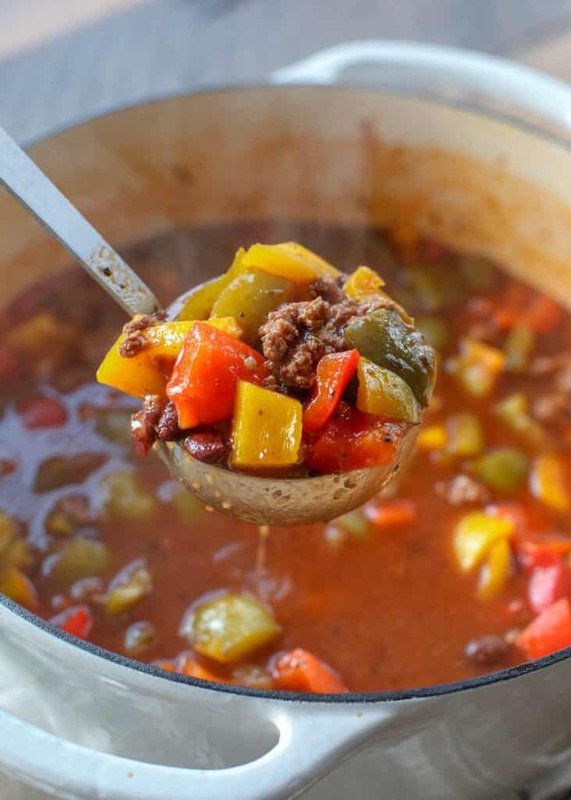 It’s a great option for both busy days and slow winter weekends when the delicious scent of cooking peppers, onions and spices will fill your home all day long. As much as I love stuffed peppers, and as relatively easy as they are to make, this soup is even easier. You can all the taste, flavor and spice of stuffed peppers without having to actually stuff anything! 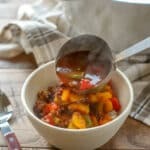 This soup uses a simple spice profile of crushed red pepper and Italian seasoning that I love with the bell peppers and black beans. You start by cooking ground beef on the stove with spices and onions. The beef and onion mixture is then added to the slow cooker with tomato sauce, beef stock, beans and peppers to cook. Serve with a generous helping of cooked rice added to each bowl. You can also make this recipe on the stove top if you prefer. Simply add the other ingredients right to the pot that you cook the beef and onions in. Cook for about an hour until the peppers are tender. Note: I always cook the rice separately from the rest of the soup ingredients when I make this recipe. Others who’ve made this soup have said it also works by adding uncooked rice to the slow cooker or pot with the other ingredients. If you do try it that way just keep a close eye on the soup to make sure the rice doesn’t get overcooked and dissolve into mush. If you enjoy this soup, or just need more comforting, easy-to-make soups to add to your repertoire, check out these incredible recipes. Broccoli and Cheddar Cheese Chowder is a deliciously creamy and rich soup perfect for those long, cold winter days. I love this Hearty Italian Vegetable Beef Soup that’s full of fragrant Italian herbs and tender meat. When you’re in the mood for a soup with Asian flavors, this Asian Noodle Soup with Wontons is a perfect fit. 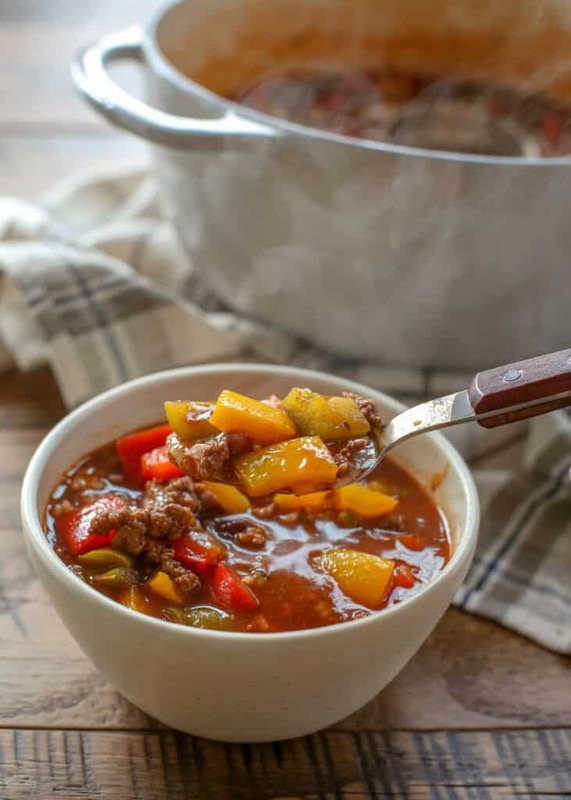 Like this Stuffed Pepper Soup, Hearty Pepper Chili uses lots of fresh peppers, beans and spices to deliver a family friendly meal with southwestern flavors suited for every time and season. White Chicken Chili and Hearty Italian Jack Chili are two more chili recipes I make over and over. I’ve also listed some of my favorite Chilis, Soups and Stews on this site for easy reference. Cook and crumble the ground beef in a skillet over medium to medium-high heat. Season the meat with 1 teaspoon salt and 1/2 teaspoon pepper while it is cooking. Add the onions to the skillet when it is almost browned. When the onions are tender, transfer the mixture to the Crock-Pot. Add all the remaining ingredients EXCEPT the rice. Set the temperature to HIGH (for 3-4 hours) or to LOW (for 8+ hours). 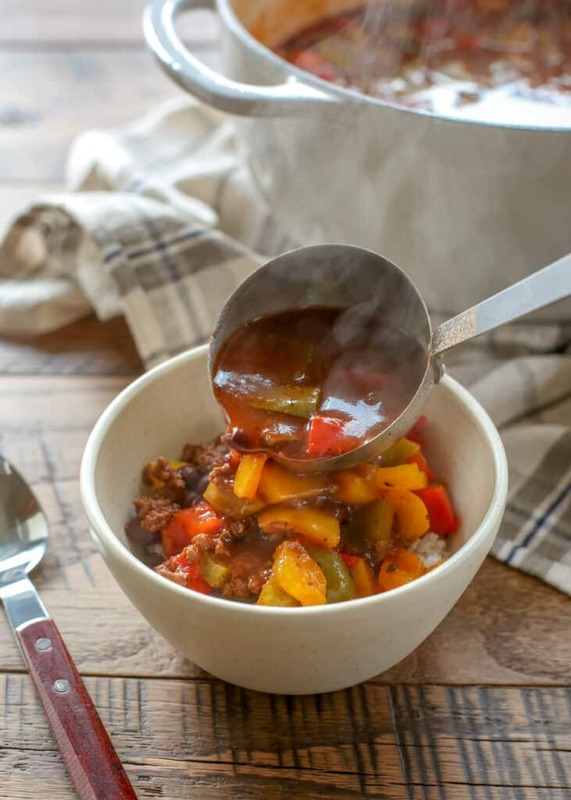 When the peppers are tender, place a scoop of rice into each bowl and then ladle soup over it. Stir to combine. 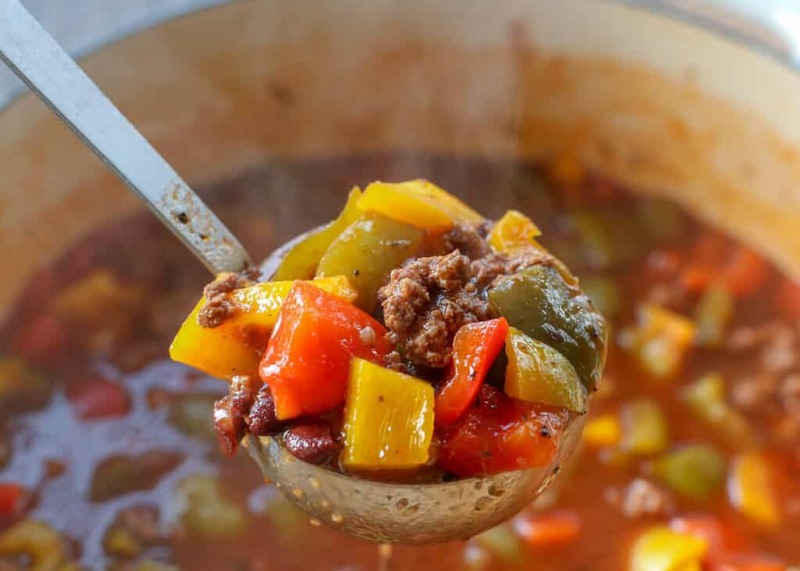 All the classic flavors of stuffed bell peppers are combined in this hearty soup. 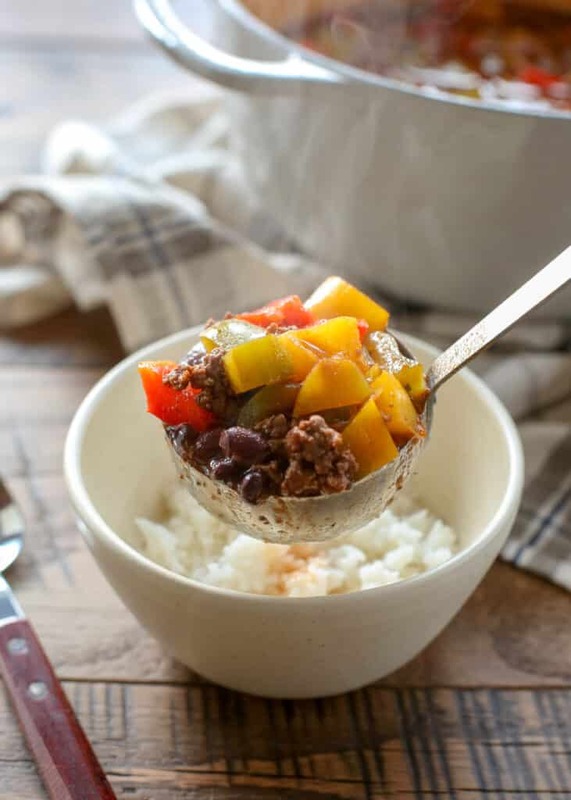 When the peppers are tender, place a scoop of rice into each bowl and then ladle soup over it. Stir to combine. Enjoy! STOVE-TOP DIRECTIONS: If you prefer to make this on the stove, simply cook the meat and onion in a large pot. Once it has cooked, add all remaining ingredients (EXCEPT the rice) to the pot and simmer on low until the peppers are tender. This should take about an hour. I have been told that this soup can be made with un-cooked rice as well, simply by adding it at the beginning. If you do try this with un-cooked rice, just keep an eye on the rice after a few hours and be careful not to overcook it into mush. Perfect timing, it's freezing in LA today! I think you're cooking all my husbands favorites. He loves ground beef and bell peppers - I will make this for him and tell him it's from you :) Thanks! Do the crushed red pepper flakes make it very spicy? If so, do you think it would still be tasty without it? I'm nervous about the spice and my young ones. Thanks in advance!! Hi Michelle, you can leave out the red pepper flakes if you're leery of the possible heat. Made this soup last week and it is the bomb! Good to know that it freezes well. Looks delicious Mary especially with the multi-colored peppers.